My review of TRENDnet's belated first attempt at its TEW-812DRU flagship AC router concluded there were just too many negatives to recommend it. Perhaps they agreed, since they now have a second version that they asked us to take for a spin. Unfortunately, the new version is not much of an improvement over the old. On the surface, the V2 looks almost identical to the first version. The only difference is a vertical USB 3.0 port in the same spot as the horizontal USB 2.0 port on the V1. 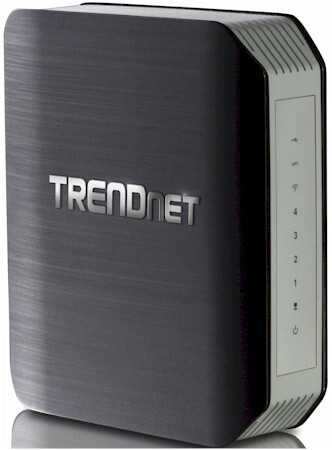 For the V2, TRENDnet stuck with Broadcom and moved up to its second-generation BCM4708A0 communications processor SoC. Comparing the V2 inside photo to the V1's below, you can see a good deal of simplification, which should yield lower manufacturing cost. This time, TRENDnet has both the 2.4 and 5 GHz radios integrated directly into the main board. A change from six single-band antennas to three dual-band antennas is also worth noting. Table 1 shows the key components for both V2 and V1. Note the reduction in both RAM and flash for V2.